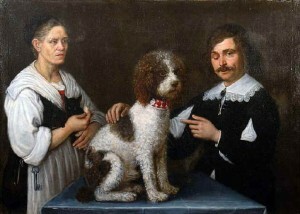 The Lagotto Romagnolo (water dog) is a very old breed dating back to Roman and medieval times. A picture of this dog can be seen in an Italian Fresco by Andrea Mantegna dating back to 1456. This small to medium breed was used for centuries as a water retrieving dog by the Valloroli in the Marshlands of Comacchio and Romagna in Italy. With their owners, the Lagotto were used to beat the hunting grounds of Ravenna diving for hours in to the water retrieving game. With the gradual reclamation of the Marshlands in this part of Italy the breed gradually lost its’ function as a waterdog and evolved as a truffle dog with its unbeatable sense of smell and it’s sharp aptitude for searching. By the 1970s the breed was risking extinction and thanks to a small group of Lagotto enthusiasts this fantastic breed was saved. ‘ The Club Italiano Lagotto’ was finally formed in 1988. Today the Lagotto is unique as it is the only pure bred dog in the world recognised as a specialised truffle searcher although they have certainly not lost their ability to retrieve on both land and water. These dogs may look cute and cuddly and they are, but first and foremost they have had years of breeding to form functional working dogs. They are small to medium size and are very clever with an abundance of energy (you can however get the odd couch potato). They need as much mental stimulation as exercise. Agility, heel work to music and gundog work are just a few of the things they are well suited to. This is not a breed recommend for the first time dog owner. They are extremely clever and manipulative. They learn very quickly and you need to be continually one step ahead of them .They can learn bad habbits’ as quickly as they learn good ones! Like most dogs they like routine and consistency. They are very affectionate dogs and love being with their humans. They can be reserved with strangers but once known to them they won’t forget you and you will receive an extremely enthusiastic greeting. They can be quite vocal, although not yappy like other smaller breeds and make good warning dogs. They are gentle and sensitive dogs as a breed and extremely loyal to their humans. If you are prescious about your garden then this breed is perhaps not for you however if you would enjoy some help in the garden then they are ideal! Being truffle hunters they like to dig but they like to dig for anything! They love to swim and you will have your own personal water dowser. Unfortunately this can also include mud! Lagotto come in different colours. Generally there is off white, orange, brown, brown roan and brown and white.